The British Shorthair cat is most commonly seen in blue, but is available in any color or pattern, with the exception of Himalayan patterns. Chocolate and lavender colors are welcomed in TICA, but not accepted for show in CFA. Most Brits are blessed with rather remarkable copper colored eyes. 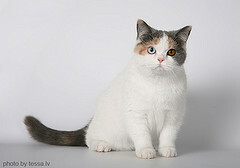 The British Shorthair has a short and plushy coat with a luxurious feel which is easily groomed. A thorough combing one or two times a week and bathing only when needed is all that these beautiful cats need to stay that way. Brits have been called teddy bears that purr, and they do have that plushy teddy bear look about them. They have a even tempered and gentle manner that is very easy to live with. Loyal cats, the British Shorthairs are not really lap cats, but love to be near their humans. Good with children and other pets, the British Shorthair fits comfortably into almost any household. 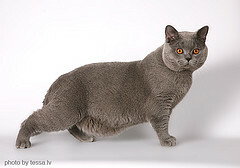 A fairly large sized cat, the Brit is none the less compact well-balanced in body shape with wonderful rounded features, a short, plush, resilient coat. The stocky appearance of these cats speaks of their rather sedate nature. Not climbers as a rule, they like to be on the ground, where they can follow their humans from room to room. This sturdy and independent breed is best described as good-natured, calm, loyal, intelligent, reserved, loving, tranquil, dignified and affectionate. Dignity is important to these cats. When a Brit knows he has been witnessed doing anything less than graceful, it is comical to watch as he recovers his dignity, and says "I meant to do that!" while flashing a truly adorable Cheshire grin. Not known for their climbing or acrobatic skills, Brits are happiest when allowed to quietly and calmly supervise their world, including the humans in it.